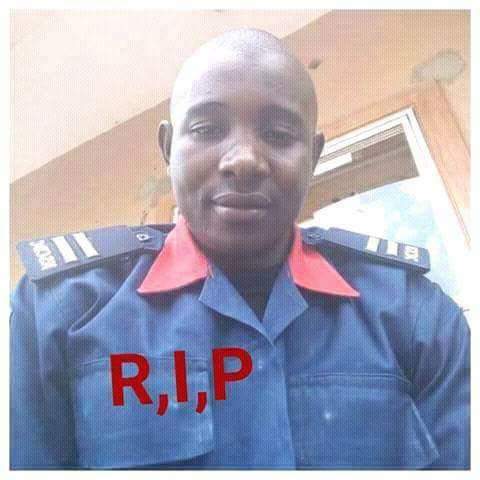 The Sokoto Command of Nigeria Civil Defence Corps (NSCDC) has lost one of its gallant officer who died in the line of duty. Nafi'u Wamakko, an Assistant Inspector of Corps lost his life as joint security operatives rescued two persons who were kidnapped by suspected armed bandits at Kursa /Gobirawa village in Gandi district of Rabah Local Government Area of Sokoto State on Friday, January 19. It was gathered that some armed bandits invaded the village on Friday and killed two innocent persons, abducted two others and carted away some valuable properties. Members of the "Operation Harmony" a joint security operatives, comprising Police, Army, DSS and NSCDC, were said to have been alerted and they went after the bandits through the forest which resulted in exchange of fire. The two abducted persons were rescued and the stolen properties recovered, but in the event Nafi'u Wamakko who was a driver to the team was shot to death by the armed criminals. The state Commandant of NSCDC, Alhaji Babangida Abdullahi Dutsinma, who confirmed the incident said some of the bandits had escaped with gun shots and appealed to the general public to report any suspicious faces around their areas. Dutsinma said that the two abductees had been rescued alive while all the stolen property were recovered. Wamakko has since been buried according to Islamic rite. chai...RIP DON TOO MUCH O!